AEG Power Solutions, a global provider of power electronic systems and solutions for industrial power supplies and renewable energy applications, today announced MoniUPS, a new remote monitoring system and associated platform of services for all Uninterruptible Power Supply (UPS) owners. Based on an Internet of Things (IoT) platform and cloud technology, MoniUPS maximizes the availability of UPS systems, optimizes management, and helps companies achieve the lowest possible operating cost for their mission critical power systems. MoniUPS is part of a complete service offer and is available with different service level agreements from basic to advanced, including a full 24x7 response if required. MoniUPS enables AEG service experts to remotely acquire data, such as energy consumption, and make it easily accessible 24 hours a day, everywhere in the world, through a tablet or a PC. It provides periodic reports on many aspects of the UPS, which are available on line and in real time, as well as telemetry and a wide series of warning and alarms, which together help in securing critical applications. When there is an issue, MoniUPS provides immediate identification of the fault, and enables fast problem resolution. In practice it has been found that 40% of potential faults identified can be managed and solved over the phone, without the need for a site visit - keeping costs low and saving time. In order to guarantee security for customers and prevent any unauthorized intrusion, the data transfer is unidirectional by design: from the UPS itself to the MoniUPS gateway. MoniUPS does not require control over the local network environment, and grants real-time interaction and communication, without requiring external network access to the UPS. MoniUPS can monitor all types of UPS systems, regardless of the brand, model and age - giving a single monitoring solution for customers who have UPS from multiple suppliers. 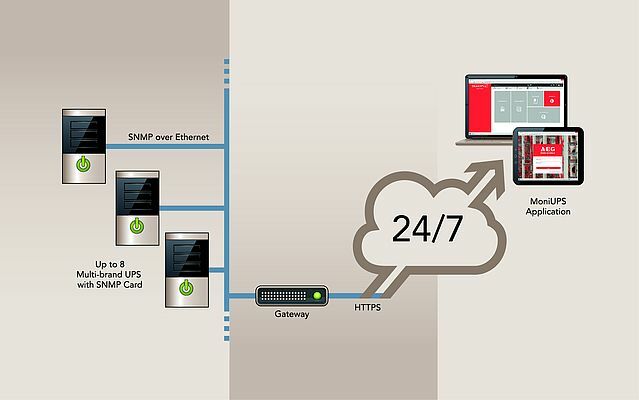 Any kind of UPS that is equipped with an SNMP-Ethernet card, or UPS connected via Modbus, can easily communicate with the MoniUPS cloud application through a gateway deployed on the local network. Connecting using Modbus adds more measures to sampled data and other additional features. "Thanks to IoT applications, smart and connected products offer exponentially expanding business opportunities that transcend traditional product boundaries: AEG PS is the evidence of this and we are proud of being part of this achievement," says Tom Davis, CEO at Solair. "AEG Power Solutions places a large emphasis on quality customer service, and with MoniUPS we have materially advanced our offering," says Jeffrey Casper, CEO at AEG Power Solutions. "An immediate response and fast resolution of potential faults are vital for critical applications, where power interruption due to a UPS fault could cause extensive damage, with large cost implications. MoniUPS and the associated functionality provides the solution that customers need, maximizing uptime and reducing the customers total cost of ownership." The company developed MoniUPS with Solair and Microsoft, based on Solair's enterprise-grade IoT application platform. MoniUPS uses the Microsoft Azure cloud platform to store data from UPS systems, which provides the highest levels of availability and security, and means there is no need for customers to install a physical server.